Science IN is a rapidly growing academic publisher which publishes peer-reviewed scholarly journals covering a wide range of academic disciplines. All articles published in Science IN are open access and distributed worldwide. website will work nicely. Regret for inconvenience caused. Full Address, City and Country. The JMSSE is a principal online international journal intended to publish top-quality Peer-Reviewed research papers in the fascinating field of Materials Science and Surface Engineering. 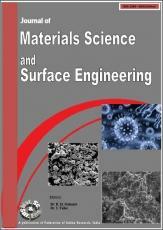 This interdisciplinary journal provides a platform for researchers to share their original and innovative findings, in addition to identifying methods of production and application that include, but are not limited to, Nano materials, Smart materials, Powder-Metallurgy & Processing, Materials for Coatings, Building materials and construction, Fusion & Fission Materials, High Temperature Resistance Coatings, Particular in the area of Structure, Synthesis and Processing, Characterization, Advanced-State Properties of Materials. JMSSE Covers Review Articles, Research Articles, Letter To Editor, Conference & Book Review, Notes and Short Communications. All the published articles are available for Download for Free. The JTSE is an international archival journal publishing scientific papers on thermal spray technology; Journal provides a platform for researchers to share their original and innovative findings, in addition to identifying methods of production and application that include, but are not limited to, HOVF, plasma spray, flame spray, wire arc spray, and cold spray, Powder technology, Gas flow, particle motion, and heat transfer, Stress and strain analysis, Coating deposition mechanism, Single particle deposition and solidification upon impact, Coating mechanical and thermal properties, Coating microstructures and phase transformation, Functional coatings, Torch design and optimization, New thermal spray technology, Robotic programming and kinematic analysis, Torch trajectory definition and optimization, Novel applications of thermal spray coating, Mathematical and theoretical analysis on related subjects, Finite Element Analysis on related subjects. JTSE Covers Review Articles, Research Articles, Letter To Editor, Conference & Book Review, Notes and Short Communications. All the published articles are available for Download for Free. Head Office: 24, Shiv Colony, Mal., IN. © Science IN 2013-2019 All Rights Reserved.